What is a chicken tractor? Basically, it’s a coop that you can move around fairly easily in your yard. The benefits of this are that the chickens will get the bugs and grass from an area and fertilize it. Also, it will also be able to provide better protection from predators. Here is our first chicken tractor that we made. It’s a basic “a” frame, with chicken wire underneath and old siding we got from freecycle for the roofing. You’ll notice the girls underneath, next to the ramp they go up to roost and to the nesting boxes. The nesting boxes are on either side of the tractor. Just flip up the wooden “thingy” and the door opens on hinges to get at the eggs. There is a door on each side, with a total of 4 nesting boxes. The one side of the tractor is permanently down, but this side opens on hinges, to get at the roost area. We are able to clean out the poop easily, since the floor is cut into 4 pieces that just pull out. 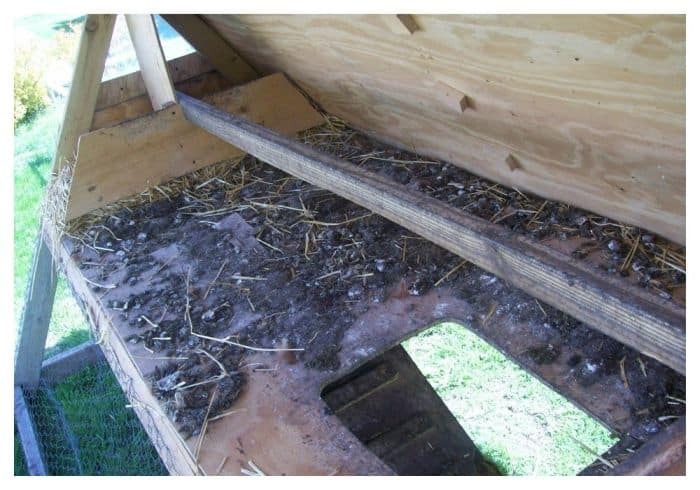 After reviewing the issue on how we had to remove the boards to clean it, we decided to take the boards out completely and the hens just jump from the ramp to the roosting bar at night, or to get into the nesting boxes. On the bottom of the tractor, is a door that we open to put their food and water in. Yes, it’s held on with a bungee cord, but the girls haven’t figured out how to open it themselves yet. I think that the next one will have bigger wheels, to make it easier to move. A friend of mine suggested using old bike tires to make it easier to move in snow and mud during the winter. 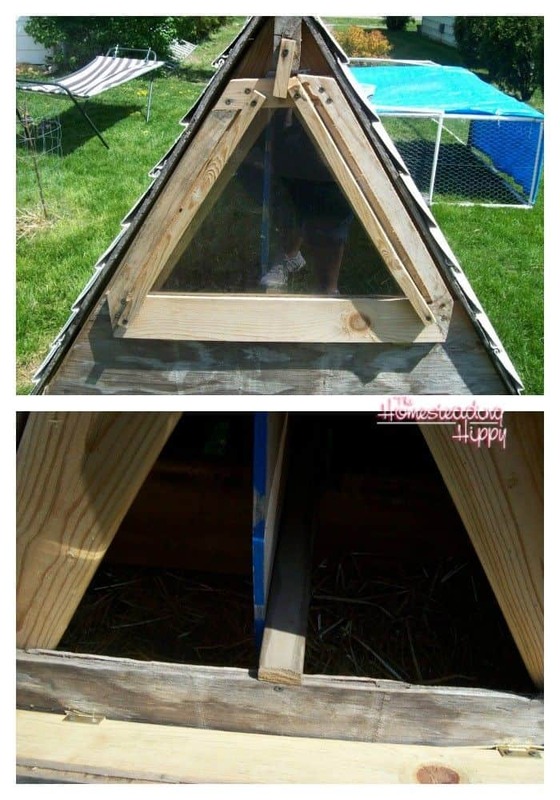 What do you use for a chicken coop? Will you try a chicken tractor this year? Be sure to pin this for later! I love your design! It looks so easy to build and to clean. That’s sooo important! It’s no fun sticking your head in a nasty chicken coop to clean it out! I’ve been trying to convince my husband to allow the girls and I to have a small flock of chickens. It would be great to have fresh eggs and good experience for the kiddos in responsibility. A chicken tractor would be perfect for us. Like the design. If you do change the tires to old bike tires please share the results.